Director Mike Birkhead was happy to share some insights and stories about working on the production ‘Namibia’s Desert Kingdom’, a documentary which in 2013 was nominated for one of the prestigious awards in the category of Best Cinematography handed out by the Jackson Hole Wildlife Film Festival. Namibia is my favourite place in the world to film. It is such a wonderful country full of surprises and the wildest wilderness you could ever experience. 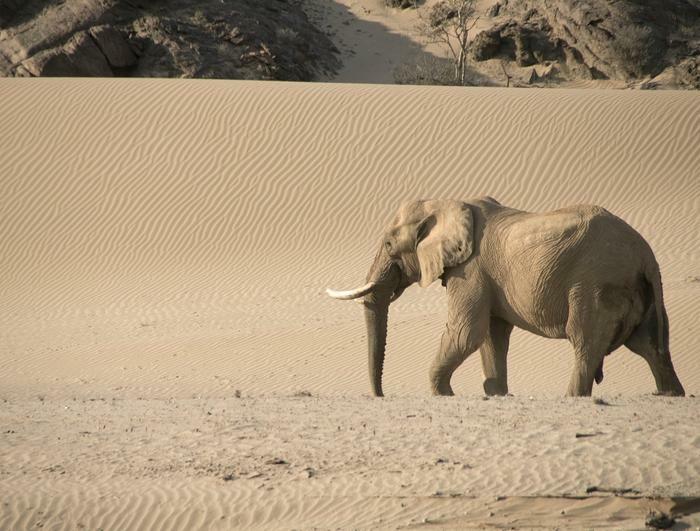 But in the vast deserts you can still find incredible wildlife… meerkats, baboons, cheetahs, lions, hyenas and elephants. On this filming trip we had the best team assembled. Martyn Colbeck is one of the world’s top cameramen, Paul Brehem is the best fixer in Namibia and Paul Lechtie is the best camp manager and the most fun guy to have around camp. I arrived for a week long trip to see how the team were getting on. They were spending 4 months in the desert and there is no need for me to be there waiting for the creatures to turn up. We had a plan and it is nice to run through it on location with the team after the first few weeks of filming. I had been to the camp site we were set up in before…. a beautiful place in North Namibia the Haurusib valley near a village called Purros. I knew we would be comfortable and eat well too – the food in camp is always wonderful! But as usual my concern was once it got dark – where had they put my tent? With lions and elephants around I like to know I have an escape plan if we have nocturnal visitors. And the team knows it too and they like to tease me! Well, Martyn was a bit more sympathetic this time as he had had a lion right by his tent on a recent trip and it had spooked him. And we all knew we were camped where an elephant had killed a tourist just a few weeks before as he walked to the toilet at night. So I insisted a vehicle, the filming vehicle was placed between my tent and Paul Brehem’s… so if anything happened I could nip into the car. Well, predictably on night one, 2.30am the dead of night… munch munch rumble rumble a big elephant was approaching. You can even hear its feet under its 6 ton weight crushing the sand! it was coming right towards my tent – it always happens! The tastiest branches were just above my tent. Then: some noises from inside the car. Paul had got in the car?? Already? That’s unlike him as I knew the elephant was right there. More noises from the car crunch bang smash… What was Paul doing? I pulled back my sleeping sheet and thought, ok if Paul is in the car I’m going too… but then I decided this isn’t right. No calls from Paul… So I waited. it was the right decision, the elephant moved off another few paces, and then I heard the other Paul who sleeps outside swearing at the elephant who had run his trunk along our bar bottles and was trying to find a tasty morel in the food tent. Anyway we all got up when the elephant moved off. What were the strange noises in the car? Well, Paul hadn’t got in – it was the elephant’s trunk that had got in through the filming portal and found our rubbish bag and a can of juice! It had crushed the can and the big rubbish bag to nothing, and put elephant saliva all over the seats. And that was just night one! To read more about this documentary and watch the trailer as well as the documentary as a whole, please follow this link which will take you directly to the production’s page.